We ,Langder Technology CO.,Ltd is an integrated economic entity of R&D,manufacturing and trading all kinds of Gas Analyzers. Through a long time development,we own a national resources system of various professional talents ,strong Technological standardization and a complete quality assurance system. 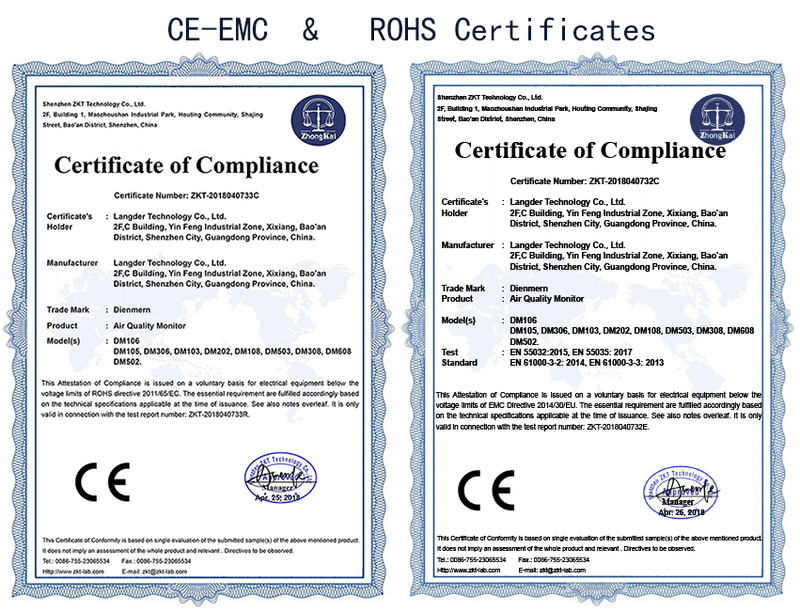 OEM , ODM are Available . 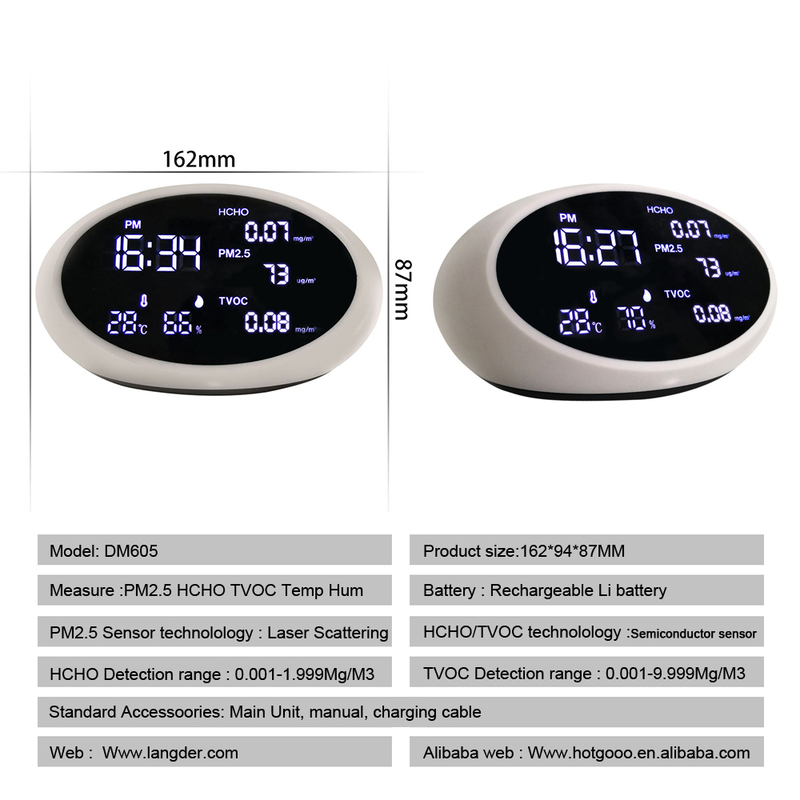 -Temperature and Humidity sensor, detect Temp,Hum. 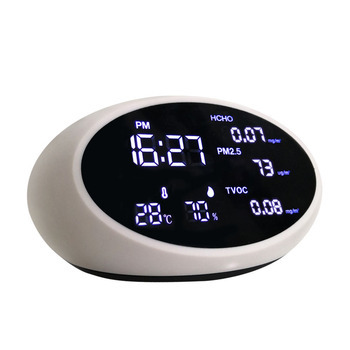 -Big TFT LCD screen display ,24 hours real time monitoring. Q. Why is the detector blacked out? A, the detector is low battery and the automatic protection is turned off. Please make sure the detector has sufficient power before use. Q: Why is the detector more power hungry? A: In the process of running the detector, in order to improve its accuracy and sensitivity, the internal program needs to perform a large number of complex calculations, and the power and demand are correspondingly increased. It is recommended that after the user runs out, please turn off the power to avoid wasting the power for a long time. A: The working mode of our products is to use the air sampling of outdoor formaldehyde-free gas as a benchmark, and then take the indoor formaldehyde content as a comparison. Therefore, the new machine product is not used for a long time, and it is necessary to detect a large change in the ambient temperature. Calibration and re-testing, the value of this calibration has a great correlation with the accuracy of subsequent tests. The calibration environment must avoid chemicals, perfumes, paints, cigarettes, air fresheners, alcohol and other chemical pollutants to avoid damage to the sensor. Q: The test value is always 0. Will the perfume rise when it is sprayed? A: Please go outdoors to recalibrate. Avoid chemical contamination of spices, perfumes, paints, cigarette air fresheners, alcohol, etc. during testing to avoid damage to the sensor. 1. Any sensor will be interfered by certain external substances during work. Therefore, when using this product for testing, please avoid contact with other chemical volatile gases such as alcohol and perfume, and smoke. " 2. The indoor air is always flowing, and the sensor is connected at different time points. The air in the air hole may be different, and the content of formaldehyde in the air may be different. Therefore, it is normal for the detection value to float up and down a small amount. 3. When using, avoid the accuracy of the air blower, blower and other strong winds directly blowing into the venting hole. The product should be placed in a relatively stable area with air flow to make the detection more accurate. 4. Before detecting formaldehyde and TVOC in the bedroom, living room, cloakroom, etc., seal the window door for 24 hours and then test it. The effect is better. Check multiple points in one room. The average reading of multiple points is The average amount of air in the room.